Teknor Apex Co. (Pawtucket, RI) has introduced a soft and elastic thermoplastic elastomer (TPE) that provides a low-cost, nonallergenic alternative to latex rubber. Beyond latex replacement, Tekron 96-E0807A-03NT opens new design possibilities because it can be easily overmolded onto other components, imparting valuable functions without costly assembly steps. According to Teknor's Peter Galland, the softness and elasticity of the new compound make it a good candidate for use as a cushioning layer on system components that need shock and vibration control. The compound is a TPE alloy based only on 21 CFR-listed feedstocks (polyolefin and SEBS rubber). It has a rating of only 3 on the Shore A durometer test and an ultimate elongation test value of 1100%. "The durometer appears to be lower than that of any other TPE on the market, and the elongation is among the highest available," says Galland. 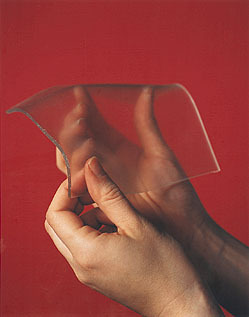 The compound's surface is smooth and dry to the touch, and it can be formulated for greater optimal transparency than latex. It can be extruded or injection molded, and applications may include seals, gaskets, plunger tips, linings, and overmolded coatings or cushions. Tekron 96-E0807A-03NT is part of a series of high-elongation grades developed by Teknor Apex Plastics Div. to provide functional and tactile properties similar to those of latex rubber without the possibility of allergic reactions. Recently the company also introduced a medical-tubing grade of Tekron TPE, designated 95X0832E-55, with a Shore A hardness value of 55. For more information, contact Teknor Apex Plastics Div. at 401/725-8000. Implant Sciences (Wakefield, MA) has developed a process for microfusing radiopaque markers to intravenous devices for visibility on x-ray film and fluoroscopes. The microfused surface is biocompatible and can achieve 100% attenuation of a fluoroscopic spectrum. This proprietary process is a form of "coupled" unbalanced magnetron sputtering, which results in an extremely dense and well-adhered microfused coating of an x-ray-absorbing alloy. 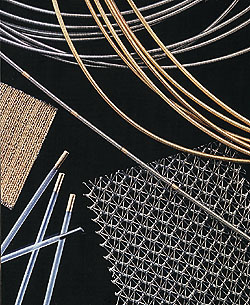 Radiopaque alloys consist of gold, platinum, iridium, palladium, rhodium, or a combination of these. Microfused radiopaque coatings create a surface up to 15 µm thick on either polymers or metals. Microfused radiopaque coatings from Implant Sciences eliminate the need for crimping and swaging of precious-metal bands, which can be abrasive and can even loosen, shift, or fall off the device in use. Because of the malleability of metal and the process itself, compressive stress is created in the microfused materials, resulting in surfaces that can bend and flex. This makes them suitable for such applications as stents and coils. In addition to radiopaque microfused coatings, the company offers ion-implantation services and other microfusion technologies such as microfused ceramic coatings, microfused antimicrobial coatings, and microfused iridium hard coatings. For more information, contact Implant Sciences at 617/246-0700. An advance in adhesive coating technology developed by Philadelphia-based Perfecseal solves many of the performance problems associated with the standard coated Tyvek lid stocks used for medical device packaging. Designated SBP2000, the adhesive formulation is designed to ensure critical seal integrity and resistance to sterilizer creep. Both features are important in medical device packaging because of exposure to rigorous EtO sterilization procedures, high temperatures and humidity, and short cycle times. In addition to high bond strength and creep resistance, the adhesive provides wide heat-sealing capability, high porosity (low Gurley rating), and good adhesion to silicon-treated polyester. Thermal adhesion under environmental stress and excellent cold flexibility help ensure package integrity and maintenance of sterility under the extreme environmental conditions encountered in global distribution. 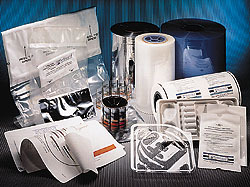 Perfecseal also provides thermoplastic flexible packaging and heat-sealed coated Tyvek and paper, film and foil laminations, multilayer coextruded and oriented films; peel pouches; custom thermoformed trays and die-cut lids; pharmaceutical labels; flexo and rotogravure printing; and vacuum metallizing. For more information, contact Perfecseal at 800/999-7626.